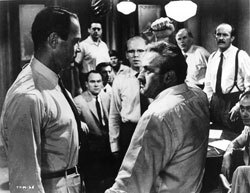 12 Angry Men is a stunning piece of cinema – just as full of meaning today as when it was originally made, it demonstrates some basic priniciples of law and of life. That all men should be equal. That innocence should be assumed, not guilt. These are truths for all time, and form the basis of this classic film. 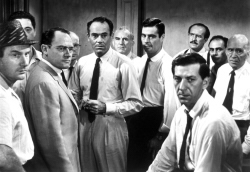 12 Angry Men starts with the façade of a courthouse, then enters quickly to show the final, bored summation of the judge. He is disinterested, he knows this will be a guilty verdict, and seemingly can’t be bothered to get too excited about it. Without even blinking, he states that if found guilty, the accused will face the electric chair. Lastly, we see the jury get up to deliberate, many of them looking across at the accused, who we finally see as a barely adult male of indeterminate, but certain, ethnicity. This all takes about 90 seconds, and the remainder of the film occurs solely in the jury rooms. By getting us inside the cramped, sweaty, jury room as soon as possible, Lumet doesn’t allow anything to distract us – we are clear that our focus should be on the jury’s deliberations, not on the victim, the accused, the lawyers or the judge. We see that it is the twelve men of the jury who are effectively on trial here… being assessed on their merits, their ability to discard their own prejudices to fairly assess another’s innocence or guilt. Not allowing us to be sidetracked by legal antics or witness fallibility, or even the names of the jurors, we have no choice but to see the evidence through their eyes. Their world views include racism and bigotry, laziness, disinterest and self-interest – in short, we realise something of ourselves in these men, and every possible obstacle to our realisation is removed for us. It is these decisions by both writer and director that makes 12 Angry Men the powerful document it is. By giving the protagonists real personalities, their behaviour is instantly recognisable. From Juror #3 who is so keen to find the accused guilty, as he sees in him his own disloyal son, to Juror #10 whose belief that the fact the accused is ‘one of them’ makes him surely guilty; we see ourselves and our peers in this room. The overly logical Juror #4 who seems to feel nothing, (not even heat, as he doesn’t sweat like the others), or the sports-mad Juror #7 who is only interested in these proceedings as they may run late and make him miss a baseball game. These are our neighbours and our friends. 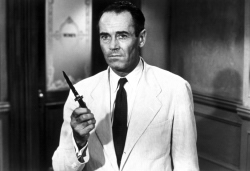 Henry Fonda as Juror #8 initially provides the sole voice of dissent, and remains the conscience of these men – he forces them to confront their beliefs, through cajoling, deal-making and outright intimidation. His is a star turn, and he is wonderful. Lee J. Cobb is particularly striking as Juror #3, in the role of his career. The other cast all perform at the highest level – there is not one poor reading, and there could not be for this film to succeed. There is nowhere for these actors to hide in this cramped film, and they really must be at their best. Thankfully, they all are. There are several interesting cinematographic techniques utilised that impact significantly on the viewing experience. Firstly, there are many long continuous shots, from the start when we follow various bystanders around the courthouse before finally entering the courtroom itself, and again often throughout. We will see one conversation between two jurors, and overhear another interesting one and turn to follow that, before returning to a different one again – all without editing, just with camera panning, and precise placement of lines and movement of actors. This technique, not allowing for editing to interrupt the sense that we are in this room with the jurors – or, in fact, are one of them – is particularly demanding of the cast. It requires them to have stage skills, for all twelve to know where they are going, and how they are going to behave, at any one time. It is much less common in these days of jump-cuts and hand-held cameras, and is a refreshing change. Another technical feature is the progressive change in camera height throughout the film. Initially, the jurors are shot from above, but by film’s end, we see them from below, with the jury room’s ceiling coming down upon us. This change contributes to the sense that this room is becoming smaller and smaller, and increases our own tension in combination with that coming from the on-screen action. Never particularly noticeable, it nonetheless contributes to the thrill of watching this film. Throughout the 96 minutes running time, we get progressively more and more tense. It’s easy to get caught up in the revelations, the changing of opinions, and the interpersonal drama. This is an exciting film, made more so by the editing and cinematography, and the excellent performances. It draws heavily upon our personal experiences of the world, and yet it can teach us something about ourselves at the same time. A remarkable film. This entry was posted in Film Reviews and tagged Classic, Drama by Mark Lavercombe. Bookmark the permalink.